The Cake Server is designed to store, transport and serve cakes and desserts for special occasions and parties. 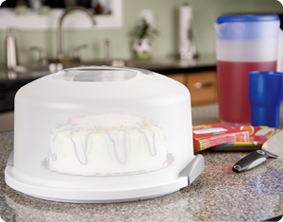 This circular cake serving container features an easy-to-clean surface and is perfect for taking your favorite desserts and baked treats on-the-go. The 2 tight-clasping latches hold the lid securely to the base to maintain freshness, and a handle on the lid allows for comfortable carrying to ensure dependable transportation. 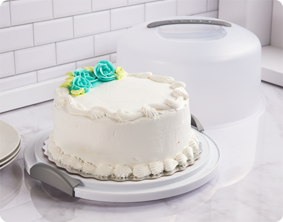 This server accommodates a 12” round cake and is BPA-free and phthalate-free to ensure your stored foods are fresh, safe and healthy for you and your party guests to enjoy. The overall dimensions for this item are 13 7/8" L x 13 5/8" W x 8" H.
Overall Assembled Size: 13 7/8" x 13 5/8" x 8"
Tight-clasping latches hold the lid securely to the base for safe transport of your confections. The Cake Server accommodates a 12" round cake and is tall enough for a two-layer cake. Cake Server is rated 4.8 out of 5 by 23. Rated 5 out of 5 by luke from It was great It was great so I bought 14 more. I also used them. Rated 5 out of 5 by SouthernGal01 from Cake Server I have carried this cake server so many places only to find it brought by others. I've had to label mine so as to bring the correct one home. It is perfect in size as not to allow the cake to slide and ruin. I've had it for several years and it still looks like new. I did break the handle, but Sterilite replaced it free of charge. Definitely a piece I would not want to be without. Rated 5 out of 5 by donna55 from Perfect! I love this for large layer cakes and I love all the Sterilite products. They are well made and made in America. These are quality products that are made to last. Rated 5 out of 5 by nettie888 from Great Cake Taker and Storer I had a cake taker from a popular company that ended up having a funny smell so I tossed it and bought this one from Walmart at a VERY budget friendly price. My thinking was since it didn't cost very much I could use it for a short period and buy another if I needed to. Well all I can say is that I was totally surprised to see how well this one holds up. It's lightweight, easy to close (unlike my previous one) and it does not have a strange smell. I really love it! I doubt that I will ever have to replace it but if I do I will be buying the same one! Rated 5 out of 5 by kyoung1983 from A classic must have This product is a must have for everyone who bakes. It's perfect for cakes, cupcakes, muffins, cookies. You name it! 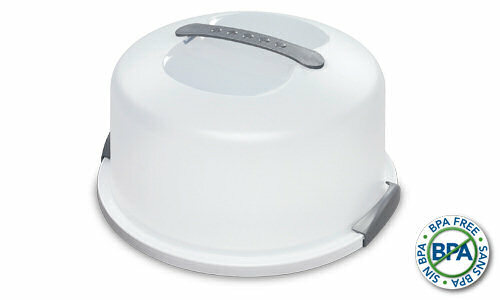 The lid has secure latches and the handle makes it very easy to transport. Fantastic product! Rated 5 out of 5 by Great organizer! from Comes in handy This product makes transporting a cake a breeze. 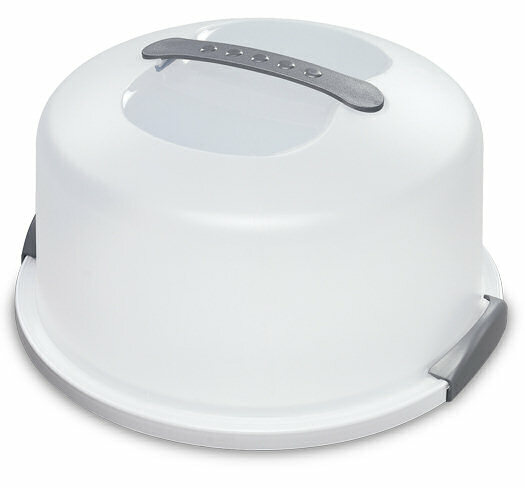 The height of the lid helps to carry double layer cakes with frosting with ease.